Discussion in 'Updates' started by CluelessKlutz, Dec 31, 2018. You may only take 2 jobs at a time by default. This is absolutely intentional, however you may earn more slots by performing tasks in your jobs to gain jobs points. 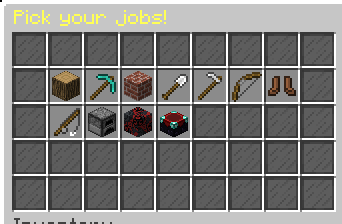 Jobs points can be used in the /jobs shop to buy up to three additional slots (allowing you five total jobs). It's highly, highly recommended you work with other players to benefit each other in jobs. Every job has been given items to produce or use that are affected by another job. Most items within the game can be used by two to four jobs in its various forms and stages. You will be able to read more on these combinations in the extended guide to jobs or by testing things for yourself. I hope you all enjoy this system and the changes it bring, happy holidays and onwards into the new year! SuperDyl, Midnight_Galaxy, iKitten and 7 others like this. CluelessKlutz, CasualNuker and Meznik like this. new jobs are very fun! thanks staff team and especially clue. CluelessKlutz, Mettekes and qazini like this.